Thursday, March 15, 6:30 p.m. ACM@UCO Performance Lab. Tickets $27 – Autobiography included in ticket price. 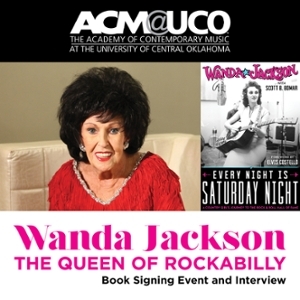 Join ACM@UCO for a special evening with the First Lady of Rock’n’Roll and the Queen of Rockabilly, Wanda Jackson, as we celebrate the release of her autobiography, “Every Night is Saturday Night: A Country Girl’s Journey to the Rock and Roll Hall of Fame.” The evening will consist of an interview with Wanda, a brief audience Q&A and then a signing of the book. For more information, contact Scott Booker, 404-974-4701.